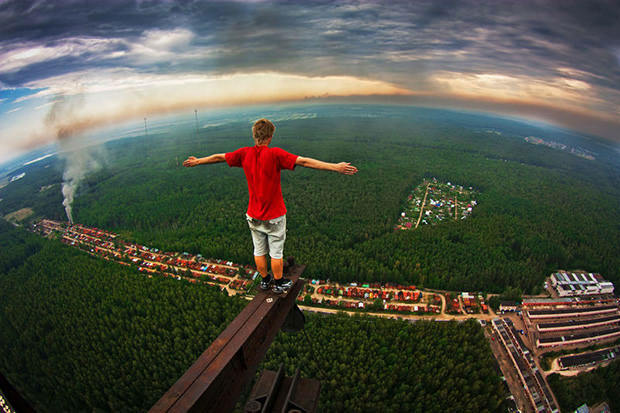 Marat Dupri, 19, of Russia scooted his way out onto a metal beam 33 stories above a green tree line in Russia, stood, and held his arms out to his sides like bird wings. Skywalking is inspired by “planking,” an internet sensation that a large part of the online population became involved in, including celebrities and people of interest. Planking is the act of lying on an object with one’s body flat and straight, usually parallel with the ground. “Plankers” aren’t looking to accomplish anything more than posting a photograph online to see who among their friends found the strangest way to plank. Skywalking takes things to new heights, literally. Skywalking began in Russia, as teens like Dupri began risking their lives to take photographs of themselves and their friends standing on objects hundreds, sometimes thousands of feet in the air. Skywalking teens pick locks or break in to the tallest buildings in their cities just to climb to the top. Another Russian photographer, Vadim Mahorov has started a sky walking spark in Russia with his photographs of himself standing on top of extremely tall objects, like Russia’s Seven Sisters, which are skyscrapers in Moscow, and Monument to Peter 1, a bronze statue in Saint Petersburg that is 215 meters tall. A senior photography student at Point Park University, Carl Bloss, can understand what the hype is all about because pictures from those heights are a photographer’s dream. Another senior photography major at Point Park, Camelia Montoy, agrees with Bloss. “I would be all over this,” she said, dragging out the word all. While there isn’t much information on this new fad, there is no safety equipment in any of these daredevil’s photographs. Check out www.picturecorrect.com/news/skywalking-photography for more images and a video of Dupri in the act.